Fifteen years ago, Robert Faurisson stated the opinion that Raul Hilberg was the only representative of the official version of the "Holocaust" for whom he felt a certain measure of respect, although only on the basis of the quantity of his work. In Faurisson's estimation he "stood far above Poliakov, Wellers, Klarsfeld and their consorts." It is undeniable that this Jewish historian, who was born in Vienna in 1926 and emigrated to America, has written a massive work on the history of the Jews during the National Socialist period, the result of many years of intensive document study. Based on the massive amount of documentary materials which he utilized, Hilberg could have written a book entitled "The Persecution of European Jews" which would have won him the reputation of a first rate historian. He squandered this opportunity because the title that he chose for his three-volume opus is not "The Persecution of European Jews" but rather The Extermination of European Jewry. Hilberg set out to prove, not only the persecution of the Jews, that is, the methodical deprivation of legal rights and deportations to camps and ghettos, but their actual extermination as well. He alleges this occurred primarily through mass killings in "homicidal gas chambers" which were constructed in "extermination camps." However, in all the mountains of German documents from World War II he was unable to find any evidence whatsoever of such an extermination, and he found just as little material evidence. 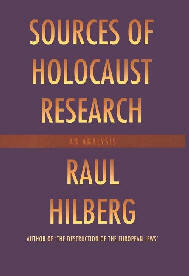 In my book Giant With Feet of Clay; Raul Hilberg and his Standard Work on the "Holocaust," I have demonstrated in detail the many ways in which Hilberg vainly attempts to prove that Jews were murdered in chemical slaughterhouses. He ignores the principle, acknowledged in historiography and jurisprudence, that eyewitness testimony is the least credible kind, much inferior to both material and documentary evidence. He turns the hierarchy of evidence upside down, inevitably giving eyewitness evidence precedence over documentary evidence. As for material evidence, he does not deign to consider it. While Hilberg easily establishes the persecution of Jews on the basis of an infinite number of wartime documents, he resorts exclusively to eyewitness testimony to back up his allegations of murders in gas chambers. In other words: without the testimony of a few eyewitnesses, we would have no "Holocaust." There are few differences between the first English edition of his work, published in 1961, and the second edition, published in 1985.
f The German version is based on this edition. For example, in his first edition Hilberg refers to two orders by Hitler for the extermination of Jews. The first order, allegedly given in 1941, concerned Soviet Jews. The second order, allegedly given after mass murder had begun in the USSR, was for the extermination of all Jews. In the second edition of Hilberg's major work, all reference to these phantom orders has disappeared without a trace. This obviously represents a great concession to the Revisionists, although Hilberg says not a single word about it. Revisionists have always emphasized the total absence of such orders; thus it seems very strange that Hilberg, who was just 59 at the time, would have been certain that his second edition was "definitive." Did he really believe, in 1985, that his theses were so unassailable that no real changes would be necessary in future editions? Did he really believe that all significant "Holocaust" research had already been completed? Hilberg's newest book suggests that the answer to both questions is "yes." 2. Sources of Holocaust Research; or the Tricks of a Paper Historian. This leads us to ask: "Exhaustively researched on a basis of what evidence?" Hilberg admits at the beginning of the first chapter that there is very little material evidence for the alleged mass murder of millions. No logical person can fathom how boxcars, boards from horse stables, bolts of cloth, coins, luggage, shoes, fishing boats and rusty weapons establish genocide committed in homicidal gas chambers. In contrast to The Extermination of European Jewry, which was published entirely without photographic illustrations, Sources of Holocaust Research contains three such illustrations (on pages 17, 58 and 59.) The first photograph shows a Jewish wedding in Holland in 1942. The second shows two bearded Hungarian Jews who had just arrived in Auschwitz in 1944, and the third a "bearded man in a fresco by Fra Angelico at the beginning of the 15th Century." If Hilberg had included an illustration of the ceiling of the morgue of Crematorium II at Birkenau, the observant reader would have noticed that those four rectangular openings through which, according to witnesses, Zyklon B granules were poured into the gas chamber, are nonexistent. Consequently poison gas could not have been introduced in the way witnesses have described. It is easy to understand why Hilberg chooses photos that are capable of arousing emotions but contribute absolutely nothing to understanding the "Holocaust." Sources of Holocaust Research is more than 80% shorter than The Destruction of European Jewry, for which we are grateful; but even so, 255 pages of paper still had to be covered with printer's ink before they could be published as a book. In order to accomplish this, the author resorts to the same tricks he used in his main work: he overwhelms the reader with a flood of information that has nothing whatever to do with the Holocaust. Distracting the reader with such themes as the prehistory of aryanization, newspapers, pamphlets, cards, and tickets, he includes the expropriation of Jewish ski outfits as well as a discussion of the literary styles of documents and decrees. He even throws in an essay by a person named Wolf Gruner concerning "the exclusion of Jewish merchants from flea markets and the role of pawnshops in the expropriation of Jewish property." In this way, he succeeds in filling his 255 pages without having to deal with sensitive subjects such as the known capacities of Auschwitz crematories. Any analysis of such chimeras as "assembly line murder in extermination camps" would collapse like a card house in the wind if its author dealt with significant topics. "On 20th February 1945, Reich Propaganda Minister Joseph Goebbels ordered the systematic destruction of all secret and sensitive papers which had to do with Jews." "The original document was found at one time in the Federal Records Center in Alexandria." From this formulation we perceive that the alleged order of Goebbels is not be found. Its existence cannot be proven. If Goebbels really gave such a verbal order, it remained a dead letter. Documents relating the National Socialist Jewish policies have survived by the ton; in his opus magnum, Hilberg quotes thousands of these, including many which were rejected as evidentiary material during the Nuremberg trials. In addition, there are no fewer than 88,000 pages of documents of the Central Construction Office of Auschwitz Concentration Camp in a Moscow archive that have been available to researchers since the early nineties. Not a single one of these documents provides any evidence of homicidal gassings whatsoever. The total absence of documentary evidence for alleged mass murders in gas chambers presents a huge problem for all orthodox "Holocaust" historians. In an attempt to solve this problem, Hilberg resorts to the same kinds of tricks that he used in his main work. He liberally supplies his readers with documents proving deportation, which nobody denies, but avoids the subject of extermination. An example of this is his printing of the timetable of the German Railway System dated 16th January 1943, beginning on page 86. We recall that in The Destruction of European Jewry he dedicated seven boring pages to the diabolical German Railroad. To explain the lack of documentation, Hilberg alleges that extermination orders were given verbally. For example he says Odilo Globocnik, the SS and police commander for the Lublin district, imparted genocidal instructions to Sobibor commander Franz Stangl on a park bench. His source for this is Gitta Sereny's book Into that Darkness, whose utter worthlessness is known to everyone familiar with it. "One frequently used prefix is 'Sonder-." At Auschwitz, where the murders could not be concealed forever, an architect of the Central Building Administration designed three barracks for storage of the belongings of Jews who had been gassed. He called these buildings 'Three barracks to store the personal effects of Special Treatment.' Underground gas chambers became 'special cellars' and ground level chambers were designated 'bathing facilities for special treatment.'" A close examination of the documents in which the prefix "Sonder" occurs shows that it was occasionally used to designate "execution," but in most instances had an entirely different meaning. As Carlo Mattogno has demonstrated, the "Barracks for Special Use" were simply barracks built for storage of the property of Jews who had been sent to the camp. The same was true of the "Bathing Facilities for Special Purposes" which were planned but never completed. These were envisioned as special facilities to combat typhus epidemics. "It is not easy to understand why the murderers would have left such bountiful evidence of their crimes behind." The question of authenticity of the Einsatz reports has not been resolved. The alleged numbers of murdered Jews are often demonstrably false, as they contradict other documents as well as forensic investigations. The same operational report for the adjoining country of Latvia states that around 25% of the Jewish population there had fled with the Bolsheviks. No corresponding exodus is mentioned for Lithuania, however. This is very puzzling because the Lithuanian Jews had as little reason to expect good things from the Germans as did the Latvian Jews. Jewish participation in the Bolshevik terror there had been proportionately much greater than in Latvia and had enraged the native population. In other words, eyewitnesses have a tendency to make up stories. The logical conclusion would be that eyewitness testimony in principle should be approached with great caution. This is not Hilberg's conclusion, however. He accepts the crudest nonsense that "Holocaust Survivors" can dish out, as long as it bolsters his contention. Three prominent examples of this are Filip Müller, Rudolf Vrba and Elie Wiesel. Vrba and Wiesel appear as crown witnesses of Jewish exterminationism just two times each in Hilberg's major work, but he quotes Filip Müller's book Sonderbehandlung no less than twenty times, which is only six times fewer than the number of times he quotes the commandant of Auschwitz, Rudolf Höß. In his disgusting bestseller, Müller relates that he nonchalantly ate cake in a cyanide drenched gas chamber. (This was no small feat since he would have to have been wearing a gas mask.) He also describes how "special unit" commandos gathered boiling fat from the burning bodies of gas victims with soup ladles and spread it over the bodies as a kind of supplementary fuel. At the beginning of his "Report of Experiences" entitled I Can Never Forgive, Vrba describes the high points of a visit by Himmler to Birkenau in January of 1943. He alleges that Crematorium II was initiated into service with the gassing of 3000 Jews. It has been firmly established that Himmler last visited Birkenau in July 1942 and Crematory II was not placed in service until March of 1943, but this does not bother Hilberg in the least. It also does not bother Hilberg that Wiesel, in his depiction of mass murders at Auschwitz in his book La Nuit, tells us that the murder weapon was not gas chambers at all. He claims that Jews were burned alive in fiery pits: still another gruesome fairy tale from orthodox Holocaust historiography. The only possible conclusion, which a serious historian can reach, is that Müller, Vrba and Wiesel are bald-faced liars and swindlers, but Hilberg treats them all as credible sources in The Destruction of European Jewry. Hilberg fails to mention that a new suit to revoke the elderly Demjanjuk's citizenship has been under way for several years. This time he is alleged to have committed crimes in the Majdanek, Sobibor and Flossenbürg camps. As usual, the charges were "proven" entirely on the strength of eyewitness accounts. But this time, we can be certain that the witnesses will not make "erroneous observations" and there will be no "lapses of memory." Right, Professor Hilberg? In Hilberg's universe, Jewish witnesses never lie; they just make honest mistakes. Likewise, German "perpetrators" never give testimony under coercion. Occasionally however they may be "possibly confused" or "indifferent to the accusations made against them." The truth is that Rudolf Höß had been beaten for three days by a British team of torturers under the command of the Jewish sergeant Bernard Clarke when he signed the confession, as Hilberg very well knows. "In his reports, Gerstein mentions a visit by Hitler and Himmler in Belzec, among other things. In reality, neither man ever visited the camp. Furthermore Gerstein's testimony is filled with physical impossibilities, as when he says that 32 persons per square meter were packed into a homicidal gas chambers at Belzec." Hilberg never criticizes Gerstein's lurid fantasies, although he makes no mention of him in Sources of Holocaust Research. In his main work, he quoted him six times as a witness to exterminations of Jews in Belzec. Why does Hilberg reject the garbage of Jan Karski but not the equally malodorous garbage of Kurt Gerstein? Apparently it is for reasons, which have nothing to do with forensic verification. The "quicklime" method of mass murder has not been yet disavowed by orthodox historiography as has the "diesel exhaust" method described by Gerstein. Furthermore the Gerstein report is the corner stone of the orthodox conception of Belzec Camp, in which Hilberg claims that 550,000 Jews were murdered. "In the course of the interviews, quite a few survivors fell into a dilemma whenever a particularly painful or depressing subject came up. Abraham Bomba was a haircutter in Treblinka who had to cut off the hair of Jewish women who were about to be gassed. During the filming of 'Shoa,' Claude Lanzmann asked him for an exact depiction of what happened while the women were being shorn: Did Bomba cut their hair with scissors? Was there a mirror? How many women were in the room? How was Bomba thinking while cutting their hair? Then he continues with his story, after one of the longest pauses in the history of the movies." Unfortunately, Hilberg spares us additional quotations of Abraham Bomba, for Bomba tells later that 60 to 70 Jewish women were crammed in a "gas chamber" of 16 square meters, and that they were sitting on benches as well-wasn't that just a little crowded? We have to ask ourselves: why does Hilberg withdraw credibility from the liar Binjamin Wilkomirski but continue to support the equally fantastic liar Abraham Bomba? Whatever his reasons, they cannot be scientific. 'Attached I am sending you an interesting report concerning a memorandum written by Dr. Wise which was released in September 1942. In view of the great tide of Jewish emigration, I am not surprised that such rumors could arise in the world. We both know that there is a high mortality rate among the Jews who are put to work. You must guarantee me that in every case of death, the bodies of dead Jews are either buried or cremated, and that nothing else can possibly occur. I instruct you to make inquiries in all quarters as to whether such an offense as mentioned in Point 1 has actually occurred. In all probability this is a lie which is being circulated worldwide, but any such offense must be reported to me, on your oath as an officer of the SS.'" Hilberg's cheating is evident in the first sentence, in which he claims that in this message Himmler is addressing anew the issue of the mass shootings. From the letter itself, however, it is entirely clear that Himmler is referring to the high death rate from natural causes which accompanied the "large scale emigration movement;" that is, deportations of Jews to the East. He is clearly ordering that the bodies of deceased Jews be either buried or cremated so that no rumors can arise, such as those about rendering bodies into soap. "Auschwitz was a camp which served several purposes. One of these was industrial production, in which large numbers of prisoners were used as slave labor. Jews, who made up by far the largest part of the arriving prisoners, were destined to be gassed, however. This could occur either immediately after arrival, or else periodically, after selection from among the camp inmates. In August of 1943, the four newly constructed gas chambers with crematoria were in service; and by this time several hundred thousand Jews had been exterminated. It was in the interest of the directors of production facilities at Auschwitz to keep their Jewish work force, however. The following excerpt from the observations of an SS leader summarizes the content of this conversation at Auschwitz on the subject. Here Hilberg is playing the trick of inventing something that does not exist. He is building a correlation between alleged mass gassings of Jewish prisoners and a topic, which he himself introduces. The truth is that prisoners were constantly being transferred from Auschwitz to other camps. Naturally, the people responsible for production were reluctant to have their skilled workers taken away, and they did everything they could to hinder such transfers. It was for this reason and no other that the above mentioned Director Wielam expressed concern about a "removal of skilled prison workers." "One should know that [...] the SS statistician Korherr had released his total of Jewish dead without taking into consideration the 363,211 Jews who were shot under the direction of the leading SS and police chief for Southern Russia, Hans-Adolf Prützmann." Everyone who has read the Korherr Report knows that it deals with Jews who were deported rather than "Jewish dead." The reason why Korherr does not include "the 363, 211 Jews who had been shot" could be simply that the 363, 211 alleged murders do not exist. 6. The Ossified Historical Concept of Someone Afflicted with Autism. If Raul Hilberg were not so deliberately deceitful, one could almost feel sorry for him. In 1961, when he published the first edition of The Destruction of European Jewry, it is possible that he might have believed his theses, by and large. The revisionist literature then in existence was of rather moderate quality, with exceptions such as Paul Rassinier's Le Mensonge d'Ulysses. Revisionism was not yet able to seriously challenge the official version of the destiny of the Jews during the Third Reich. In the following years and decades, however, revisionists steadily gained ground. Then came the first Zündel trial in Toronto early 1985, shortly before publication of Hilberg's second "final" edition of his opus magnum. Called as crown witness for the prosecution, Hilberg was caught in a murderous cross-examination by Zündel's defense attorney Christie, who reduced him to a truly pitiable figure. More than fifteen years have passed since then, and orders from Hitler for extermination of Jews still have not been found. Exterminationist authors such as Gerald Fleming and Jean-Claude Pressac have burrowed through mountains of Auschwitz archives in Moscow without finding the slightest evidence for the existence of homicidal gas chambers. Meanwhile revisionist authors relentlessly continue to publish new books and articles, which expose the fragility of the orthodox "Holocaust." Even the disciples of Jewish annihilation are forced to drastically reduce the numbers of victims. Raul Hilberg in his old age is forced to survey the ruin of his life's work. He realizes that nothing except transient political connections keep him from being unmasked as a charlatan and pseudo scientist. One would expect an appropriate silence from such a person in such a situation. But no: Hilberg writes a book entitled The Sources of Holocaust Research obviously expecting the customary acclaim from fawning journalists. Instead of praise, however, the book has been met with ridicule by investigative historians. Like an autistic child he clings to his ossified picture of history. He persists in "unlocking" and "interpreting" documents, meaning that he is still trying to impart meanings, which they never had. Wouldn't Mr. Hilberg have done better to analyze his sources, before he committed his 1,300 page "definitive" work to paper? First published as "Der unheilbare Autismus des Raul Hilberg" in Vierteljahreshefte für freie Geschichtsforschung, 7(1) (2003), pp. 107-114. Translated by James Damon. Quotations retranslated from the German translation of this book: Die Quellen des Holocaust. Entschlüsseln und Interpretieren, S. Fischer Verlag, Frankfurt/Main 2002. All page numbers refer to this German edition. Robert Faurisson, Ecrits révisionnistes (1974-1988), four vols., private edition, Paris 1999, p. 954 (vol. III). Fischer Taschenbuch Verlag, three vols., Frankfurt/M. 1997. The second and "definite" edition of his original English version The Destruction of the European Jews, from which the German version originates, appeared in 1985. Theses & Dissertations Press, Casphaw 2001. Raul Hilberg, The Destruction of the European Jews, Quadrangle Books, Chicago 1967, p. 177. The text of this edition is identical with the one of 1961. On p. 60, where Hilberg endorses Pressac's thesis, according to which the morgues of the crematoria in Auschwitz were converted into "gas chambers" only later on. This "women's hair" is a homogenous straw blonde color, which leads one to conclude that it is probably flax. In reality, most of these shoes had been produced by Majdanek inmates, who were working in the workshops of the local fur and garment factories: J. Graf,C. Mattogno, Conentration Camp Majdanek. A Historical and Technical Study, Theses & Dissertations Press, Chicago 2003, chapters I, V.
 RGVA (Rossiskii Gosudarstvenni Vojenni Arkhiv, Russian State War Archive). This archive is located at the Viborg Street in Moscow. Vintage Books, 1985; Ger: Am Abgrund, Munich/Zürich 1995, pp. 117ff. See in this regard Carlo Mattogno, Jürgen Graf, Treblinka: Extermination Camp or Transit Camp?, Theses & Dissertations Press, Chicago 2002, chapter I. The subtitle of the German edition of this book is Decipher and Interprete, whereas the English subtitle is simply An Analysis. C. Mattogno, „Sonderbehandlung" ad Auschwitz. Genesi e significato, Edizioni di Ar, Padua 2001, as well as C. Mattogno: "Keine Extrawurst: Sonderbehandlung in Auschwitz", VffG 5(4) (2001), pp. 452-454. Gerald Reitlinger, Die Endlösung. Hitlers Versuch der Ausrottung der Juden Europas, Colloquium Verlag, Berlin 1992, p. 225; Engl: The Final Solution, J. Aronson, Northvale, N.J., 1987. Cf. re. this chapter 7 in C. Mattogno, J. Graf, Treblinka, op. cit. (note 10). "Einsatzgruppe A: Gesamtbericht vom 16. Oktober 1941 bis 31. Januar 1942." RGVA, 500-4-92, pp. 57-59. The arguments listed here were taken from chapter 7 of Treblinka, op. cit. (note 10), authored by C. Mattogno. G. Reitlinger, op. cit. (note. ), p. 248. NO-5193 as well as NO-5194. Vilnius Ghetto, List of Prisoners, Volume 1, Lietuvos valstybinis zydu muziejus, Vilnius 1996. Abraham. Foxman, "Vilna - Story of a Ghetto," in: Jacob Glatstein, Israel Knox, Samuel Marghoses, Anthology of Holocaust Literature, Atheneum, New York 1968, p. 90. Ernst Gauss, Dissecting the Holocaust, Theses & Dissertation Press, Capshaw 2000, p. 44. Gauss refers to an article in the Lituanian newspaper Lietuvos Rytas. For details I refer to my book Giant With Feet of Clay (see note 3). I cannot forgive, Bantam Books, New York 1964. Edition de Minuit, Paris 1958. In a footnote, Hilberg indicates that Vrba wrote his book in collaboration with someone named Alan Bestic, while Müller wrote his with the help of someone named Helmut Freitag. "Demjanjuk persecuted anew by US Jews," VffG 2/2002, p. 239. Actually, about twenty fold. Furthermore, Höß stated in his confession before the tribunal that in Auschwitz alone, as of the end of November, three million people had died (2,500,000 million from gassings and 500,000 from starvation and disease.) According to this confession, the total number of Auschwitz victims would have to have been much higher. Rupert Butler, Legions of Death, Arrow Books, London 1983, pp. 235ff. Story of a Secret State, 1944. Motion picture by French producer Claude Lanzmann, nine and one half hours long. Its entire text was translated into German; published in book form, entitled Shoa, in Düsseldorf, 1986. < For this, see Barbara Kulaszka, Did Six Million Really Die?, Samisdat Publishers, Toronto 1992, pp. 22 ff. Source: The Revisionist 1(3) (2003), pp. 344-350.